If Parker’s does another serial series like this, you can bet I’ll be buying each story each week! *Disclaimer: I received a review copy of this book from the publisher, in exchange for nothing… yeah, told me I didn’t have to read, review, or even make a post I got it! **The Two of Sword series was originally a serial novella series from 2015 through the end 2017, with a single novella coming out each month. There were 19 parts in total, and upon collection, they were broken up into a 3 volume set. 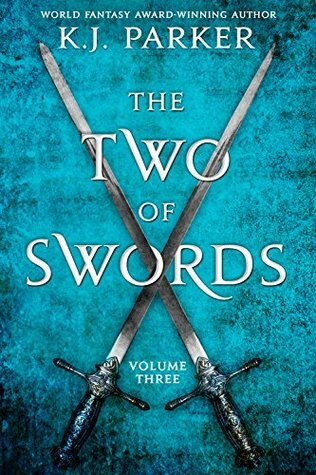 The Two of Swords, Volume 3 contains the novellas 16 to 19. This final volume was an unexpected surprised to me. In the end, I can say it was a pleasant surprise, but at the start… well, I’d be lying if I didn’t haven my stubborn pants on. If you’ve read my past two reviews, you are probably immediately wondering what could have surprised me at the start to put me in a foul mood. I’ll tell you: CHANGE. The purge has begun. The Lodge has officially declared war on both the Eastern and Western Empires. The Empire has responded in part by banish and killing all known members of the Lodge. As one might guess, Lodge members have taken up high position, and many of them, in both Empires. So, when this mass exodus of Lodge people hits the Empire, you can image how this would affect the running of the government. Then, when you take into account that the Belot brothers have whittled each other’s armies down to maybe a couple thousand a piece – this all puts the Lodge in very good position. And everything would be running smoothly, if it wasn’t for the rumored schism. I don’t have a problem with change. I read different authors, from different genres, with different prose, styles, and storytelling, of different genders, and times-periods. Nearly all of those factors change with each book I read. What I don’t like is when things suddenly change 2/3 of the way through. With each of the first two volumes, I loved how the story was based on and went from character to character (sometimes repeating, but mostly new), without a second skipping in time. That stopped now. Parker’s storytelling took a major turn in the final volume. We actually start off with a brief history lesson about the slave trade in the Empire (where did that come from and why do we need to know it? ), and then, in the same novella, we learn about the childhood of Procopius (yeah, that other musician). All of that last about 15 pages before we come to Telamon burying her mother. May not seem like a big deal, but up until now, each novella only has one POV character per. Then after that, each novella’s POV character is Telamon, and only Telamon… And remember how each chapter used to be the name of card that related to some character? Those are gone. Now it is “Part One”, “Part Two”, “Part Three”, and “Part Four”. Many are probably in udder shock and wondering if this is my only complaint. Yes, this is my one and only complaint (and it is totally legitimate, I don’t care what anyone says). What I loved so much about the first two volumes was the uniqueness of the storytelling and the skill and planning that must have gone into it. So to start this Volume off with what felt like a random history lesson, a backstory to character who had no real role in the story, and then to get a character that we had already seen many times before… it was a bit of let down, because it was not how the story had been being told. Once I finished the story, I realized why those two parts were put there, and why it was that we had to have Telamon as the only POV for the final volume. And admittingly, I really don’t know how Parker could have finished the story otherwise. But again, it just wasn’t what I been used to. Despite this, if look down at my sore you’ll see that I gave two 4.5 rating! That is because, outside of the change in storytelling, I loved everything about this! Unlike previous volumes (and most of Parker’s work), I didn’t feel like there were any slow moments at all, and I would lose track of time reading this. Most questions you wanted to know: who leads the lodge; Belot brother’s history; Oida and Axio; Lodge’s mission. All these get answered. And I bonded and felt for Telamon like I cannot describe. But that 0.5 I added to novella Part Seventeen was because of Telamon; and the 0.5 I added to Part Nineteen was because of how great Parker wrapped everything up. Personally, I would have liked to learn more about several of the one-time POV characters, but all of them do have re-occurring roles in the story, despite not being the main POV; and I would have liked the cards – the theme and meaning of them to the story – to have stayed a bit more in focus. It felt like that fell off after Volume 1 and didn’t actually come back until Part Nineteen. All-in-all: I loved the series. It was written as serial series, so you could realistically pick-up the book, and read a chapter (novella) every week and still be completely satisfied and eager for more (unlike many other books where chapters can vary). If Parker’s does another serial series like this, you can bet I’ll be buying each story each week. How interesting – I hadn’t realised that this author had released his stories in a series like this – it’s almost like Charles Dickens whose stories were released in a serial format so that the ‘masses’ could afford to buy them in instalments. I hope you get your interview. Expect, unlike with Dickens, there aren’t any of those boring “filling” chapters that were written just because their needed to be a new chapter for the month XD I remember we actually skipped a handful of chapters in A Tale of Two Cities when we read it in high school.